Over the past few years, the green world of fashion has seen an unprecedented boom, with pioneers like Emma Watson and Rosario Dawson raising awareness to the matter. Recycled gowns and eco-friendly studios are springing up like mushrooms, encouraging customers to make more sustainable fashion choices. Thankfully, such major transformation in pop culture point to a grassroots conversion toward fashion that’s more sustainable. You may not be attending premieres and fancy galas, but you can still make sure your summer styles are gentle on the environment. Here are some useful tips you can use to become a more eco-friendly fashion consumer. While this rule of thumb cannot apply to everything (we’re thinking of socks and unmentionables), but cutting back on your laundry is literally the easiest way to go easier on the environment. Greening your laundry starts with wearing your jeans more than once before throwing them onto the dirty pile. If you wear them at least three times, you can consume 5 times less energy, according to the UN Environment Program. Combine this green tip with washing clothes in cold water and skipping the dryer. Levi’s recommends you wash their jeans every two weeks instead of after every wear. If you properly care for your clothes, you can prevent excessive buying habits. Proper maintenance refers to regular washing, as well as wearing your clothes alternatively, so you don’t overuse the same shirt and jeans. You can also save a lot of energy by washing clothes in front-load washers in cold water. In addition to energy, you’re also reducing your water and detergent consumption. Help curb CO2 emissions and electricity bills by drying clothes on a clothesline cuts. If you simply have to dry your clothes, avoid perchloroethylene, a common solvent known for its environmental and health risk. Which takes us to our next tip. To maximize your green laundry habits, consider a do-it-yourself laundry soap. Fortunately, most of the ingredients are readily available at your local grocery store, and mixing them together couldn’t be easier. The best part is that you’ll always know what you’re dealing with (and what you’re keeping out). As you experiment, you can even customize your mix to include fresh fragrances and essential oils. Here are some recipes for liquid and powder detergents you might love. With more than 88 million dryers in the U.S., the carbon dioxide emissions per year are going through the roof. Dryers use too much energy, so if you skip it altogether, you can make a real difference. Just make sure you your neighborhood or municipality doesn’t oppose to hanging clothes to dry. As an added bonus, you can also prolong the life of your clothes if you skip the dryer. When you line dry them, garments last longer because they’re going through less wear and tear. You can improve your choices by simply researching clothes and brands before going shopping. Your goal should be building and maintaining a sustainable wardrobe. Investing in natural fabrics – silk, cotton and wool – is less harsh on the environment than buying synthetic fabrics like polyester. Ideally, you should seek out environmentally consciousness companies that are transparent about their production process. Meanwhile, avoid clothing with labels like ‘wash separately’ and ‘permanent-press’; such extra instructions are bad for the environment. To get right down to it, we recommend staying away from fast fashion – brands like H&M and Forever 21 – because their synthetic fibers harm the environment. Also, they usually produce collections that are relevant for just one season. Instead, make a habit out of thrift shopping and checking out vintage stores. You’ll find have reused or recycled clothing options that will last you much longer. For the items you want to buy new, invest in staple pieces like black dresses, blazers, and high-quality jeans. Don’t throw your clothes in the trash when you downsize your wardrobe. Instead, think of donating those clothes. Places like the Project Safe Thrift Store or Goodwill will be more than happy to take clothes, shoes and accessories. They are then sold inexpensively as part of a positive sponsoring programs. You might not want to give up on your clothes, but convince yourself you should donate anyway. Think of it this way: the less clothes in your wardrobe, the less washing and drying you need to sustain your style. Last but not least, we’re here to give you some good news. You can skip the tedious chore of ironing! 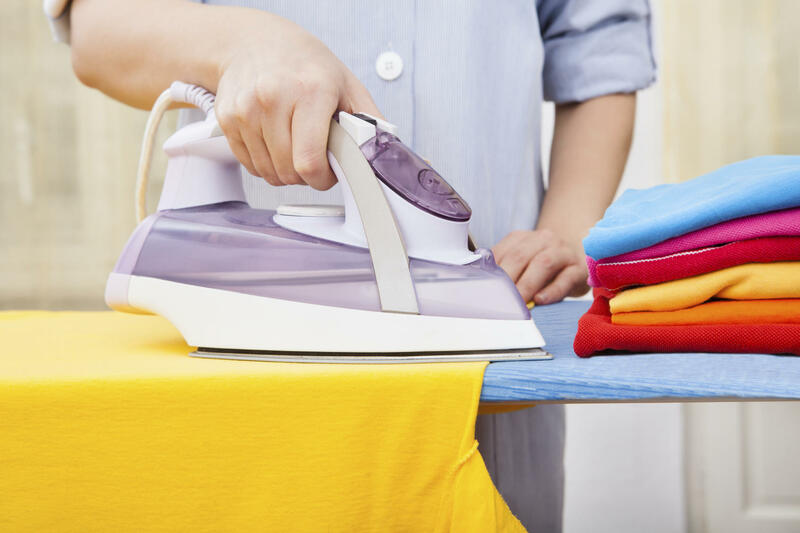 Most of us hate the idea of ironing, so you will be glad to know this activity consumes energy and deteriorates fabric. So why do it? Because no-one wants to look ruffled in an important meeting, right? To avoid looking fretted, just hang up your clothes immediately after the wash cycle is complete. Thanks to the water still in them, gravity will help pull most wrinkles out. For wrinkle-prone clothing (like linen), skip the final spin cycle. This way, you create even more pull with the water still in the garments. When you take them out, fold the dry clothes where you want to create creases, and place them under other clothes in your closet. No need for extra pressing!